21st of the 12th, 2000 and 12. This is another date of significance. 3000 years ago, The Mayan’s created a calendar. And it’s date end’s today. End of the world as we know it. they’re the key words in that sentence. Does this mean a spiritual change or a physical change? No body really knows, although the Peruvian’s take it to mean a new consciousness; a shift in perspective and priorities. And that doesn’t seem such a bad thing. Then there are those that believe in the Tablets of Thoth, and Atlantis, and then again, it could truly be a self-prophesised state of affairs. Depends on how the thousands of cultures around the world take it. if the world is going to end, why not be the one to do it? That fame, or infamy, can be a mighty temptation. However, short lived. oops sorry, got distracted looking out the window. Harbour Bridge – Suicide lane. Anzac Bridge to the left, cloudy day on the harbour but snatches of blue sky hang back, letting the chunky puffs of cloud cross over. Observatory Hill. A lone bench waits under the majestic Moreton Bay Fig. Always a witness. Flashing screens rest in the hands of this final day’s commute. It’s good to smile. To see a smile. A genuine affection. It’s also good to find a coffee. plonked myself at a cafe in the city now. Decided to take a tourists approach to breakfast. There are certain parts of Sydney that truly remind me of New York. not that this is one of them, but just that whole touristy feeling. Been so long since I’ve been a tourist traveller, or a travelling tourist. How about a travelling local – I am a local member of this earthly community, am I not? Either way, it’s long overdue. To run my hand along ancient walls. A glimmer catches my eye. It’s just the moving reflection of a widow being forced open. Letting in, and inviting all this corner has to offer. I’m not a stranger here. My “G’Day” is as authentic as they come. Yet the ties which bind this are not blood. There is nothing about me. No cell, no appendage that was created by Australia. However, we are all star-dust, and land mass doesn’t need names to exist. For all that makes up Australia, makes up me. We are one and the same. From dust we came, dust we are, and to it we return. Perhaps.. it is within each of us that the world will end. Perhaps.. it is my responsibility to take the step forward, the movement towards a heightened understanding of this strange life and world I’m inhabiting. I like wearing my sunglasses. It let’s me look at people, admire them, enquire of them. My previous one’s were dark, and these new ones not so much. So I think people can see my eyes now when I’m looking at them. Behind these lens’ lie lens’ – a lifetime of witnessing, absorbing, contemplating and judging. And yet, many more lifetimes will walk past me; with their own loves, regrets, their thoughts of self-reliance and responsibility. Not all have real dreams left. The death behind the lens’ is already visible – old, young doesn’t matter; they’ve given up on reaching anywhere near where they were promised; what they’ve been led to believe was possible within the miasma of collages this life really is. But the driving force is still there. They still walk. A whimper, but a flicker is more than enough to get a flame going. It’s Christmas, and I’m on holidays. It’s time for me to stop talking, and start being all of the above and more – until the love I have inside is not blocked by those I throw my arm over as I sleep. I have so much to give, yet so few seem able to truly accept it. Surely. Someone new. Someone able. And the urge to continue writing goes on – almost as a requirement of allowing myself this delicious, expensive breakfast, at this lovely cafe. If I don’t write in this journal, then i’m just another lonely person, eating breakfast alone. But with these sunglasses, headphones, notepad and pen – well! I could just be that incognito journalist, or that fancy traveller, maybe that restaurant critic they’ve heard about. Not just some hungry, tired, mid 30’s chick with bed head on her way home from a night out, writing line after line of just random thoughts in a cheap journal to make herself look busy. 102 is all it takes. That’s this morning, although it was probably closer to about 60-65 when the phone call came through. The Farmers were on the phone. Asking me what had I done. How did I do it? And telling me, that the NAB Solicitors had just been on the phone. Telling them, that they had been *thinking* about their situation, and had *decided* that evicting them before Christmas was the wrong thing to do. And that they would like to allow them to stay until the 8th JANUARY!!!! The sound of joy in her voice, is one that I will never forget. The dancing around the restaurant that I was doing, is one that my work colleagues will never forget. The feeling in my soul that I, we, had effected real change to real people, is one that will always be there. That change is possible, That people, working together, is a real and viable option. I was/am almost in a state of disbelief. I mean, this is the one of Australia’s largest banks – one of the “Big 4”, and yet a small group of dedicated people had forced their hand to be more compassionate. The only people in the world that can make real changes is everybody. Each one of us, joining hands with out friends/family/internet citizens, can make real change. I can’t get them their farm back. But I will forever know, and hold dear, that visual of just one family being happier on Christmas Day. One at a time. I’ve made a start. Christmas is a time to be surrounded by love and compassion, and “peace on earth, good will towards men”. Not in Australian Banks, it’s not! NAB evicting Farmers on Christmas Eve. Please.. everyone. I don’t often ask for your help, to really come together and to make a direct change. The Priestley’s (Farmers) are being evicted on Christmas Eve. (if not this Sunday). From the house that their father, who died from the stress of this horrific court case just over a year ago, had lived in his whole life. And due to the NAB refusing to delay a hearing, Chris and Claire were actually in court in Sydney at the time their father passed away. They can never get that back. And now, the NAB has beat them in the courts, the very place the Code of Banking Practise is meant to stop struggling farmers and small businesses ending up in. The code is meant to make things fairer, but they’ll do their damnedest to get you in court, so they can flex their legal and finance capabilities against you. Even the most recent Judge stated that the “CEO has a lot to answer for”. He had been given a copy of the leaked “Constitution” document, that categorically states there is an over-arching, joint sitting, round-table group of Bank CEO’s that decide which cases are investigated when a complaint is made to the supposed “Independent” Code Monitoring Committee. Really. This “Association” exists. In Australia. But with the Priestley’s eviction imminent, they’re no longer being given the opportunity to sit around the Aussie Christmas dinner table, with their close friends and family, and farewell the memories of the past 100 years that their family has worked this land and built this home. To have lawyers and bankers come to your door, on such a day that heralds “peace on earth, good will to men” is just sickening and despicable. I want to change this. I want them to have some sort of chance at closure, although there will never been an end to this in their hearts. But to at least offer them a mental closure, a chance to farewell, to say thank you and good bye to their home. I want to give them Christmas in the house. It all started with a request for my email address from a good friend who lives out in Dubbo. Said he had information for me about a local family that was being screwed by the NAB. A few hours later, 5 emails came through, and one by one described the awful situation that a brother and sister were facing. Claire and her brother Chris are 3rd generation farmers, on a property that has been in their families hands for over 100 years. Their property is a mix of cattle, wheat and cotton farming, surrounded by pristine nature, and bordered by the Macquarie and Barwon rivers, in the North West of NSW. This is their home. Now all of this is about to taken away from them. Surviving 9 years of drought, this is a family who couldn’t be destroyed by Mother Nature’s worst but now they find themselves about to be evicted by parasitic, immoral, impatient bankers from National Australia Bank. In a time where most loans are around the 7-12% mark, NAB has made millions from the percentage gap on what we pay, compared to what they pay for the money – especially in this post GFC world, whereby banks can practically steal the money from the Reserve Bank, both here and the US Federal Reserve. Yet, the opportunity to make even more money is always so very temping, and thus when the farmers came to them to assist, and at a time where there was the best opportunity to trade out of debt came from the sky in early 2010, when the Boxing Day 2009 rains finally broke the drought, they couldn’t help but take full advantage of the situation. The rains gave these farmers, who provide our entire state with food, who have been struggling for so many years, an incredible climatic opportunity to address the debt bought about by nine years of drought. But the NAB told them to sell the farms without a crop in the ground or deal with the default rate of their 18% interest loan as they refused to advance anymore finance to grow crops when the drought broke 18%! Most credit cards aren’t that high these days. And this is after 9 years of drought, and a flood. Because Claire and Chris refused to sell up before taking advantage of the best season to trade out of debt, they went ahead sowed the 2010 wheat crop. They then were then served Farm Debt Mediation that forced unreasonable obligations on them that did not take into consideration a Natural Disaster, because of this they breached their Farm Debt Mediation agreement (one clause being to repay $1million to the NAB by January 2011 based on the 2010 wheat crop). With help from local people they got by, and managed to not have to sell the farm in early 2010, they sowed the 2010 wheat crop which proved their viability by growing an 18,000 tonne (about $5million) wheat crop only to see it destroyed by the November 2010 floods. If the NAB had assisted them to use the abundance of water that had returned to the Macquarie river because of the incredible season in 2010 they would have been able to use this income to make up for the loss of the 2010 wheat crop, however the NAB refused to maintain the farms, and in the same year the NAB assisted Cubby Station to grow cotton when it was in administration. At the time the NAB called in Chris and Claire’s loan. They were told they had 49% equity but it was of no use to them as they could not get finance to continue to grow crops. Refinancing was made impossible because it appears that once the NAB eliminates you and Farm Debt Mediation is served, other financiers are reluctant to assist, especially when credit was near impossible due to the GFC. They were never in the financial crisis Cubby Station was in, yet they were crucified and blocked by the NAB of having any hope of running the land profitably as the NAB did for Cubby Station in 2010. All options are being investigated to fix this situation, reluctantly they put the farms up for sale by auction on November 17, 2011 to show the NAB they had tried, they failed to sell and now the NAB are seeking possession. Usually a farmer is given the chance to sell again in six months and keep the farms running and using every environmental opportunity possible to bring income in until it is sold satisfactorily, but not in this case. Investors have been and are being sought; a community and equity partnership with the Aboriginal Community of Brewarrina and Walgett was very well received by the Department of Education, Employment and Workplace Relations (who is conducting a feasibility study) and the NAB initially. Cameron Clyne is the NAB CEO who is at the forefront of NAB Reconciliation Action Plan, and Glenn Brennan NAB Indigenous Affairs Manager, however, both seem to be full of talk and no action. This isn’t about not wanting to pay the money back. This is about being a farmer at the mercy of Mother Nature, and now of this prestitute bank, ironically being a main supporter of “2012 – Australian Year of the Farmer”, and making over $1.4billion profit in Q2 (Oct-Dec 2011) + record profits in 2011 – is unable to wait for the study to be completed(End April) and has given an earliest date of eviction of the 12th April. The NAB has shown their determination in this matter, without a thought for the big picture. To not even wait 12 months for a full cycle of growth. To not even wait while the head of the family, their father, Gordon Priestley lay dying in hospital whilst they were also isolated again in the February 2012 floods. 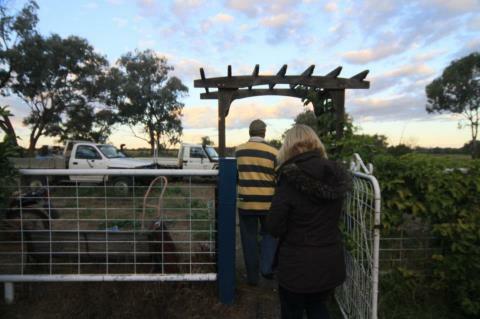 The NAB were requested twice to defer the Supreme Court proceedings as it was impossible for Chris and Claire to file a defence due to Chris being isolated on the farm due to the floods and Claire caring for her father in Dubbo and then Brewarrina Hospital where he passed away on February 19, 2012. They were also told that the DEEWR feasibility study into their Aboriginal proposal needed time to be completed by end of April, but they were told that the debt is out of control and the interest is accumulating too much and that Aboriginal projects take too much time, however they did not mention that the NAB are in a partnership with Indigenous Business Australia the main funding body for such projects..
And so while the NAB continued its relentless pursuit, they left their father in hospital to meet with a solicitor to see if he would represent them on February 20. Their father passed away while they were trying to get legal help, yet bravely, only the next day they attended court in Sydney where the Louis-Vuitton clad lawyer for NAB still showed no mercy, all the while her high-end labels cloaking the heartless corporation that lives beneath and clocking up legal fees Chris and Claire Priestley will have to pay. In addition to this, they have been trying to get Centrelink to assist them for living costs as when they asked the NAB for living money when their father was dying they were refused and told that the NAB had already been good to them. This bank who promotes itself as “More Give, Less Take” is its own antithesis of what it promotes. It’s time to truly understand and appreciate the integral work that our farmers do, and the challenges they face. The NAB claims this family has broken their contract, yet at the same time, the NAB is blatantly breaching theBanking Code of Conduct. Today – 10th December marks a day they will never forget. The courts have judged against them, and they have until 9am to get out. I don’t know what to do, how to help. I don’t know how they must be feeling. Devastation is an underrated word. This all ties in with the Banking Code of Practise, and I can promise, NAB – You have not heard the last of us. You will be held accountable. You will be brought into the light. And you will be ashamed.